Discussion: Mike and Mike chat about the anticipation surrounding the announcement about Apple's new device (rumored to be called either iSlate or iPad); also about Amazon.com's announcement about their new 70% royalty for Kindle products; and some new developments in electronic editions of textbooks and a possible shift in e-book pricing from major publishers. 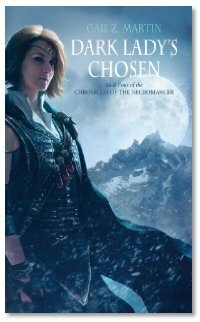 Interview: Gail Z. Martin, author of "The Chronicles of the Necromancer" series, revisits the Dragon Page to chat about the most recent volume Dark Lady's Chosen. Gail also talks about the social networks surrounding her books and universe, and about her spring Con and Festival travel schedule... if you drop by, tell her you heard her on The Dragon Page!